HOUSTON (ICIS)--US spot ethylene on Thursday fell below the 14.25 cent/lb floor that it had been trading at for nearly two weeks, as supply remains long and sentiment remains soft. Front-month April ethylene traded at 14.00 cents/lb on Thursday, matching lows set 16 years ago in March 2002. Front-month April ethylene had previously dropped to 14.25 cents/lb on 6 April, and trades had remained at that level until Thursday. A value at about 14 cents/lb "does seem to be a floor against cash costs so far", a market source said. The downward pressure on ethylene prices is due to long supply and concerns that proposed Chinese tariffs on some grades of polyethylene (PE) could slow downstream ramp ups and leave ethylene oversupplied. Supply has outpaced demand in 2018 as good production and new cracker start-ups have outweighed the slow ramp-up of new downstream PE capacity. Several new PE units, which started up in late 2017, have not reached full operating rates due to logistical, certification and specification issues. Although some of those issues have improved, some continue. PE average monthly production rates in January and February were flat to average monthly production rates in the fourth quarter of 2017, according to data from the American Chemistry Council (ACC). Meanwhile, new ethylene capacity has come online. Dow Chemical started up a new cracker at its complex in Freeport, Texas in September, and Chevron Phillips Chemical started up a new cracker at its Cedar Bayou complex in Baytown, Texas in March. Each unit has an ethylene capacity of 1.5m tonnes/year. Ethylene spot prices have been on a downtrend since early 2018 as the growth in ethylene production outpaced the growth in consumption. However, prices fell sharply following the announcement of Chinese tariffs in early April. Much of the new ethylene and PE capacity that is coming online is geared toward future exports of PE, with China expected to be a key market. Demand growth in the US and in traditional export markets like South America is not expected to be able to absorb the increased PE volumes. 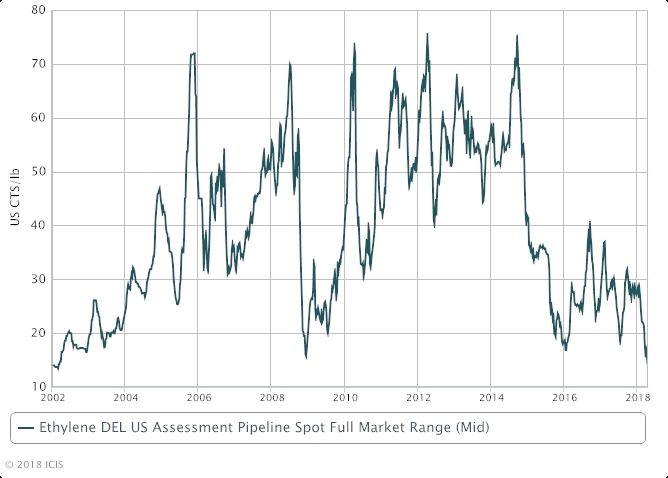 Further downward pressure is possible if ethylene capacity expands before new PE plants are ramped up. Two more crackers are expected to start up in this quarter. "The big wild card is the imminent Indorama start-up and if ExxonMobil starts their new cracker up in May," the market source said. Indorama is expected to start up a previously idled cracker in Lake Charles, Louisiana. The unit is expected to have an ethylene capacity of 420,000 tonnes/year and propylene capacity of 20,000 tonnes/year. ExxonMobil is expected to start up a new cracker at its complex in Baytown, Texas. The unit is expected to have an ethylene capacity of 1.5m tonnes/year.